There's an old saying which derives from some flawed thinking which goes like this: "If a little is good, then more must be better" This could be applied to anything in life. In the case of gardening and landscaping, this is also true of applying fertilizer, though this is for the most part something I personally don't do at all. Not with the practice creating an underground "Earth Internet". Why even watering plants where a health mycorrizal grid or network system has been installed is less of a chore and far more economical, especially for those folks who live in the high water rate district areas of the southwestern United States. To save time and space, I believe I'll include the 3rd question posed here in this post as it has practical applications which help with overcoming mistakes in different water requirements. The above picture illustrates perfectly what we often think of a when it comes to community plantings in a container pot application. And true enough we deliberately choose certain specific plants because they may have the same feeding and watering requirements. However the same applies to wild environments, but also includes our home gardens and urban landscapes. You may be familiar with terms like Chaparral Community, Desert Community, Sub-Tropical or Tropical Community, Grassland Savanah or Prairie Community, Temperate Forest and Arctic Habitat Community. The idea here is that all the plants within any type of habitat community have basically the same conditions and requirements for successful living. This is true enough, though some vary within that community with regards requirements and actually can have an interdependence on each other for health and vigor. This is where a healthy underground mycorrhizal community or "Earth Internet" comes into play. Not only has it been shown and demonstrated that these fungal networks have the ability to transport water to all in the community, but they are able to transfer various plants chemicals produced by one plant to another. It was for these reason that my own personal plant community architecture always including specific plants which grow together in nature. Here's an example of this community symbiosis cooperation program which benefits other plants in transporting beneficial chemical properties between plants. 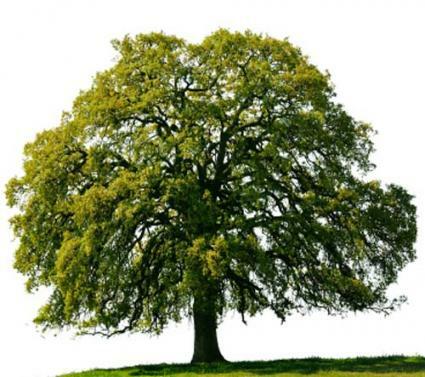 Here is an example of the cooperation between two trees. Douglas Fir (Pseudotsuga menziesii) and a common Pacific Northwest tree called Pacific Madrone (Arbutus menziesii). Here is the title below and the abstract of the scientific study. It does get technical at points in the paper, but I think most will grasp the importance of the association of specific plants within any community. "Possible Role of Mycorrhizas in Resistance to Decline in Arbutus menziesii"
"A complex set of factors is causing decline of Pacific madrone (Arbutus menziesii) in the Puget Sound region; yet, some trees remain healthy. It is unclear why they do. We are investigating the hypothesis that symbiotic associations between the roots of madrone and soil-dwelling fungi make the trees less susceptible to disease. The effect could occur either directly or by providing physical links to nearby Douglas-fir (Pseudotsuga menziesii) trees through which carbon compounds are transferred to the mycorrhizal systems and, perhaps ultimately, to the madrones. In this initial study, our objectives are to determine whether: 1) madrones growing near Douglas-firs are healthier than madrones not growing near Douglas-firs; 2) healthy madrones have more and/or better developed mycorrhizal associations than declining madrones; and, 3) madrones associate with the same mycorrhizal fungi as nearby Douglas-firs." "The Decline of Pacific Madrone (Arbutus menziesii Pursh): Current Theory and Research Directions"
Basically this paper describing a Symposium which dealt with the health and decline issues of Pacific Madrones in the pacific northwest. The same conclusions and plants community observations were noted here between the two trees. Clearly plants within specific ecosystem communities have adapted over thousands of years and have indeed benefited by the "Earth's Fungal Network". This is important info as it has practical applications within any urban landscape and home gardening layout. It's true that much of the scientific information and papers can be heavy at times, but once you grasp the import and meaning of the value of a good 'Fungal Network' operating system functioning within your own landscape, you'll never be forced again into doing things the conventional way which involves chemical fertilizers and pesticides and alot more of your own hard earned money. Establish the right networked community and chemical pesticides won't be necessary. This has been my experience. Never under-estimate the importance of designing the proper plant community network for your landscape and garden. Here's a personal testimonial of something that was a turning point for me in my life to never take for granted just how important the fungal community which I call repeatedly "Earth's Internet" really is to any environment and plant maintenance success. I've known about and studied this for years. I was involved with several forestry planting projects in the San Jacinto Forest District. One such program dealt with biodiversifying the monoculture Jeffrey Pine forest on the Garner Valley Floor just east of Lake Hemet. The Forest Biologist at the time wanted to establish a population of healthy Black Oak (Quercus kellogii) trees in among the already existing and sparsely or loosely spaced tall Jeffrey Pine (Pinus jeffreyi). Well I use to actually collect these very strange looking dried truffles for shipping back to a commercial mycorrhizal inoculant company called Plant Health Care Inc (PHC). The general feeling around that biodiversity planting project in Garner Valley was that there was enough healthy biological material thriving in the soil already and there was no need to inoculate with any commercially produced soil inoculent. Unfortunately, none of those Black Oak seedlings survived. Yet I have to say that I totally agree with the goals of that project for creating a more biodiverse vegetative habitat which in would have encourage greater wildlife diversity. I did however manage to later salvage one of the seedlings from Idyllwild area and took it home to plant on my acreage to add to my own private biodiversity collection. Unfortunately that particular day when I arrived back home I was tired. The seedling procurement was an unplanned after thought and I hadn't exactly created that particular ideal spot for placement on the property. Therefore, being tired and in a hurry to wash up, I realized that I had to do something temporarily rather than leave it in a bucket where it most likely wouldn't survive. So sticking it in the ground was a temp solution until I had the time to plan out where I wanted it for good. From that point onward I only passively visited the tree. I never replanted the way I thought I would do and like the failed project, I too thought that there was enough biological "Earth Internet" activity going on in my soil to justify being lazy and doing nothing further. What a dipstick mistake that was!!! The first year I did baby it a bit. Gave it generous portions of water and it did grow just a little over a meter in height. That was encouragement enough for me to do nothing as I had previously convinced myself. Yet I should have soil inoculated with PT Mycorrizae. I didn't and 12 years later and one year before I sold my property, the tree was only a mere 10 inches above that initial years one meter growth spurt. The tree after that first year barely struggled to survive all those other eleven years. The central leading bud grew only about an inch a year, every year after that first initial year and the leaf size never grew in size beyond what you see below in these small scrub oak leaves. 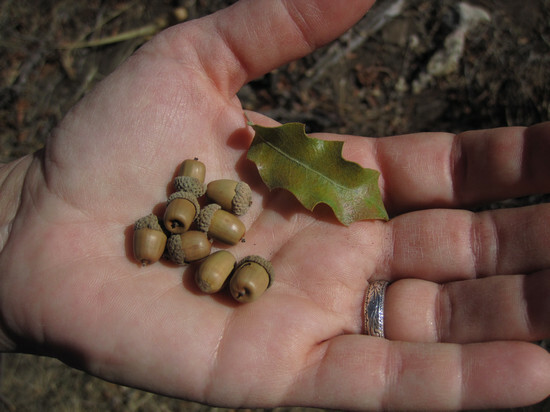 Here's a pic of a man's hand holding some acorns and scrub oak leave to give you a sense of size scale that characterized the small pitiful size of my black oak's leaf size as a result of my neglect. Clearly, anyone familiar with California Black Oak leaves knows that the size is much much greater than what the above pic illustrates. Nevertheless, I only briefly paid any attention to it because for the most part it was on the back 40 so to speak. But then one day after twelve years I was out performing some soil inoculation on yet another experiment to prove a hydrological network does indeed exist among a grove of pines all connected and mutually benefiting from the same mycorrhizal network. With some of the PT Mycorrhizae mix I got from (PHC & Dr Don Marx) left over, I walked past that little pathetic Black Oak tree and thought to myself, what the heck, why not ? As I've done hundreds of other times before, I drilled some small 4 inch deep holes where I thought the feeder roots were under the small trees drip line. The goal of course is to target the feeder roots where those tiny root hairs are present. When the tiny root hair cap which pushes ahead of growth in the soil comes in contact with one of those PT spores, it will hopefully detect those acids given off by the root tip and then germinate. If not the spore simply remains dormant. 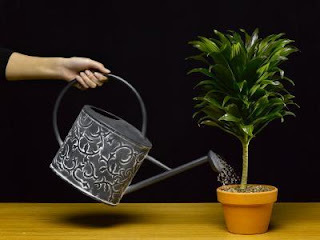 Once again I proceeded to baby the tree that first month only by watering generously once a week for the first month. 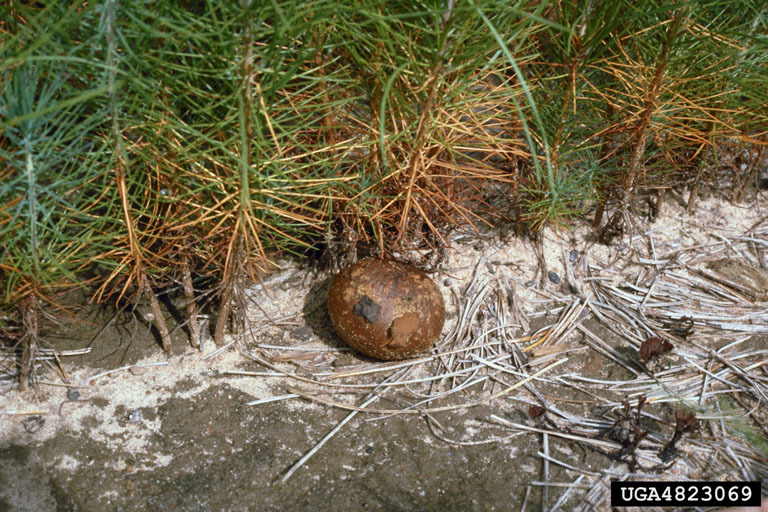 Sure enough, there appeared a small thumb sized Pisolithus Truffle almost identical to the one illustrated in the pic below. At this point, I'd like to mention that in almost every inoculation of an already existing tree for which PT Mycorrhizae which is host specific (meaning it will only colonize certain specific species of trees around the globe) I have had the same identical experience. After watering exactly one small thumb sized Pisolithus Truffle will appear around the drip line of the tree. The fact that it appears will be proof of it's colonization of that particular trees root system. It can only form as it has need of drawing from the carbon nutrients from the host tree. However, you will NOT experience or observe any improved growth effects on that tree for the rest of that year. But you will have the satisfaction of knowing that the inoculent took hold. Again see the pic below of the first truffle growth. Once again, it won't be till next year that you will experience an incredible change in appearance of your prized tree. Once again, it won't be till next year that you will experience an incredible change in appearance of your prized tree. For me the change was an incredibly profound turn around in the way I viewed the importance of the power potential of inoculating before planting. I had always known of the potential benefits, but experiencing something so dramatic etched this experience into my brain cells and I've never forgotten it. Here's what took place that spring after a long winter's dormancy. The buds swelled up rather large and proceeded to explode with a growth spurt that I had not ever seen before with the exception of that first year. Eventually the central leader stem grew one and a half foot. The side branches grew almost exactly 12 inches. The leaf size was about 6 or 7 inches long. Here's a pic below which demonstrate the size of the leaves. Once the Pt Mycorrhizae is established on the plants there should be no reason to reinoculate it again. Each year new truffle spore will be spread throughout the soil by other critters whose job it is to tillage and work the soil thru and thru. You should also note that in nature there are numerous fungal associations by numerous different species. Like a biodiverse forest, you'll want to inoculate your plantings so that the biodiversity extends all the way deep into the soil. I view PT Mycorrhizae as a pioneering fungus. By that I mean, in any ecosystem after a disaster or disruption like a forest fire, there are always those pioneer species of plants that appear first to pave the way for others in a succession to the ultimate goal of an old growth forest situation. In some eastern United States forests, Black Locust (Robinia pseudoacacia) is one of the first trees to appear. Black locust has nitrogen-fixing bacteria on its root system; for this reason it can grow on poor soils and is an early colonizer of disturbed areas. Another example of pioneer species here in Sweden is the Birch[Björk] which will appear after the industrial forester clear cut an entire forest. Consequently I view PT Mycorhizae as just such a pioneer in forest or urban landscape establishment to be then followed by other beneficial fungal inoculations. Here is the PHC Reclamation website which will be of further benefit to those with an interest in reclaiming disturbed sites. Once again, this very experience had a profound effect on me. Though I had known for years what the fungus would do and how plants would benefit, it was that deep appreciation of just what I had that finally hit home. I hope that others can and will learn from this experience. It was at that point while standing there looking at the huge difference in growth that I realized just what kind of tree I could have had at that point had I not been so lazy and putting things off as I did. Can YOU imagine what that tree would have looked like after 12 years of this specific "Earth Internet" connection ??????? There are a number of other important things to consider in the landscape. There are the plant community types. Certain plants have identical requirements which means placing them with plants outside of their natural community will be a problem. In your landscape consider features like having a lawn. View the lawn as a lakeside or stream habitat setting. Plants inside or along side this setting will benefit from the extra watering a lawn requires to look good. Other drier habitat plants will not want this. Though they may experience even spurts of growth at first, they will later rapidly decline in health and vigor. These are all the little things you NEED to consider when planning your landscape whether you appreciate it now or later after failure. Sometimes failure is the only way to learn. I ought to know.